This one is Marvel related in that audiences have seen this character before, most notably in director Sam Raimi’s misfire that was 2007’s “Spider-Man 3,” wherein he tried to squeeze too many villains into the kitchen, which made the story making for what turned out to be a misguided mess. I thought his “Spider-Man” from 2002 was just average. On the A-F scale, I graded it just a C. I liked 2 a lot better, giving it an stellar grade of an A-. In “Spider Man 3,” “Venom” attaches himself to Peter Parker (Tobey Maguire) only to latch on to Topher Grace’s Eddie Brock later in the story. Raimi incorporated subplots galore with a menagerie of villains with The Sandman (Thomas Haden Church), Green Goblin (James Franco) and Venom/ Eddie Brock (Topher Grace). It did not work with all of the bad guys together. As a part of the series, it disappointed me to no end, but dealt with a lackluster conclusion. I gave this one a C-. But we’re here to talk about “Venom,” a character that is integrated into the “Spider-Man” universe. The main character besides Venom is now Tom Hardy’s persona of reporter Eddie Brock, a hot-shot investigative journalist who for all intents and purposes is a one man band. His significant other is Michelle Williams, Anne Weying, a big time corporate higher-up who knows some of the same people that Brock is investigating. The pair clashes from time to time, and after a ludicrous event they are all but over. He covers anything and everything, and the one fact that always remains is that it must be true. What we’re dealing with here is called a synobite, a foreign alien DNA that needs a viable host to just live and survive. This alter-ego is referred to as Venom, who can take out adversaries with a single swipe or bite as it were. The pair co-exist in Brock. Brock has to teach Venom, while the alien DNA does not approve of being called a parasite. Eddie wants to emphasize that they only take out bad people, not just commoners on the street. One of the strongest parts of the ensemble comes from Golden Globe-winning actor Riz Ahmed, who plays the main antagonist of the movie, Carlton Drake, a wealthy industrialist who has welcoming hands with ulterior motives in mind. He also knows of the aforementioned symbiote as well. His alter-ego is Riot, a malevolent villain who cares little for human life. Director Ruben Fleischer has scored strokes of genius with 2003’s “Zombieland,’ but also foul balls with the dismal “Gangster Squad.” (2013). He also gave audiences the fun ride “30 Items or Less” in 2011. 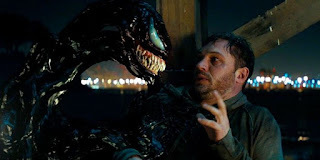 “Venom” clears the rough and entertains from beginning until its end, leaving room wide open for a sequel whenever the studio looks at the final numbers to fund the next chapter, because there is a lot more to tell.